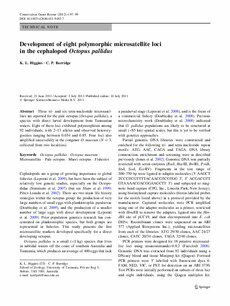 Three tri- and six tetra-nucleotide microsatel- lites are reported for the pale octopus (Octopus pallidus), a species with direct larval development from Tasmanian waters. Eight of these loci exhibited polymorphism among 92 individuals, with 2� alleles and observed heterozy- gosities ranging between 0.034 and 0.85. Four loci also ampliﬁed successfully in the congener O. maorum (N = 3, collected from two localities).